For catering the variegated demands of our respected clients, we are highly engrossed in providing a wide range of Bow Drill. 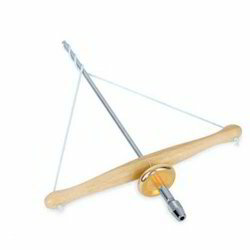 - Just twist the string around the shaft and press down on the wooden bar. - The drill will spin and the weighted wheel gives it enough momentum to repeat action. The straight-blade solid rigid centralizer is used during operations in which casing centralization is a primary objective. Sizes Ranging: 4 1/2" to 20"
Total length : 7' 10"
Available in all standard sizes and special sizes can be manufactured as per client requirement. As a customer-focused organization, we are providing a wide arrayPVC Bow Spring Centralizer. In addition to this, we are providing these products at very leading prices. - Available Size: 4-1/2" to 13-3/8"
GAURAV Semi-rigid bow centralizer withstands high lateral loads and is specially designed with double crested bow profile which enable these to be compressed through tight spots and severe dog legs where low starting / running forces combined with very high centralization forces are required. - Slip-on centralizers are manufactured with solid end rings that can be easily slipped on the casing OD during installation.